Welcome to the new Home of the Ohio Disaster Search Dogs! We are working to add new features and content, so be sure to come back frequently! “The Bravest Rescue Puppy” is a family-oriented, storied tale of Zena. Zena (a young Rottweiler) is a promiscuous, full-of-life, chow-hound puppy that was looked upon, by some, as “too much trouble”. All of her brothers and sisters found new homes – no one picked her. Zena missed her brothers and sisters yet the world outside, and food, pique her interest. Zena’s high energy and playfulness lend themselves to what she would eventfully become – a search and rescue dog. From this story-point on, “The Bravest Rescue Puppy” becomes “the tale that wags the dog”. 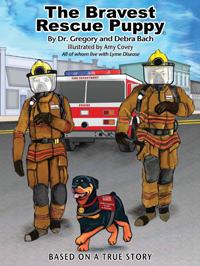 Based on real life members of the Ohio Disaster Search Dogs family, Zena is a wonderful children's book! Plus your purchase through this site helps benefit ODSD! It's a win-win!